This wallpaper was featured in Colorfull-Wallies group! 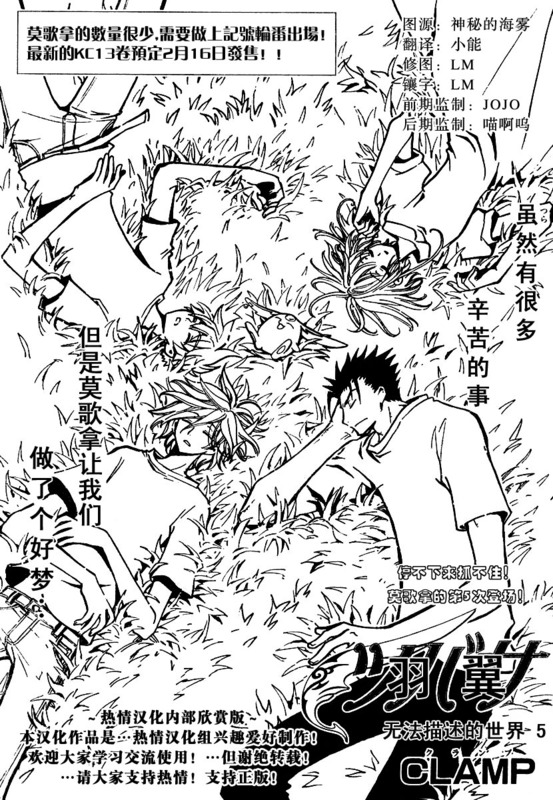 The original pic is a black and white scan from the manga of Tsubasa Reservoir Chronicle and you can see it HERE. It took me 2 days and, well, it's definitely different from their usual style I think...or not? Anyway!, when I finished coloring the four of them I was really happy until...THE truth downed on me : I had forgotten there were the grass left to color...Urrrgggggg! I can see the hard work you have put into this. It's lovely :) Good luck for the competition! This is a really cool coloring! I think the blood on Kurogane's pants is a little too much, but I guess we had to show that he's a warrior somehow... Good job! Daaang...that's awesome! I don't think I could ever have the patience to do something like that. The lines look fine, and the color wotk is amazing. GREAT job! Your Effort Deserves More Than A Favs ! All the edge in this wall really absort to eye and make we feel fresh & lively ^_^ I will ask Phill-chan sothat she can agree with me for the top fea or not, but sure this wall will still be nor fea anyway so don't worry. Good work. But it really looks like you could have used some of the new features in Illustrator CS 2... Namely the Live Paint. It would have made that grass "issue" not as big of a deal. You can draw regions without a black line (like for the grass shading) and fill in the color later with something like the Paint Bucket tool. Still the "Live Trace" would not have worked well for this image because of the text, so the vectoring of the black elements would still have been a pain..
First, good luck in the coloring contest. Lastly, when I looked at the wall close-up, I could definitely see all the work that went into it. It does look like it'd take you a long time to do with all the details and little particulars you added in. But if you loook at it not considering all the work you had to do, I think it's definitely a scan-quality; and by that I mean that someone could've scanned it in from an art book or something (this is a compliment, even if it may not seem like it...). Overall, very nicely done, Cutesherry! That looks awesome! Wow, I really love the vector and colors. You must've worked extremely hard on this wallpaper. Great work! Great drawing + good vectoring + coloring + so much hard work = favorite! wooooooow really great! thx for this! I can see you put in much effort into this. Great wall. Love it. Keep them coming. 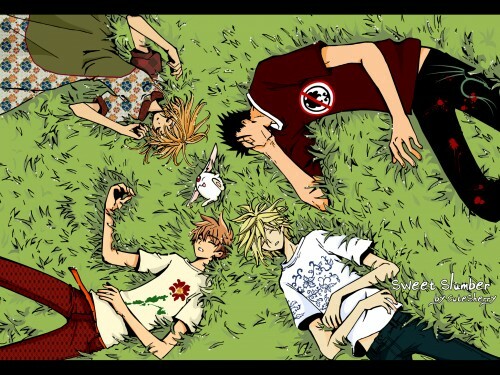 It reminds me of 'Honey & Clover', there is a picture similar to this one. I loved all the patterns and details you added to their clothes and the colors and painting are simply gorgeous! The pic you chose is really troublesome but so pretty that worthes the effort :D ! The angle you put the pic is nice too! Please, keep up your splendid job and thanks for sharing it! woh~ great job on vectoring and coloring the scan ^^ Really love the wall! perfect for a nice lazy summer!